Nothing does more for the value of your home and standard of living more than a beautiful, modern, kitchen renovation or remodel. No matter what your style, a custom kitchen is something that nearly every homeowner dreams about. Fortunately, if you choose to work with Turner Carpentry, it doesn’t have to be a dream forever. Kitchen renovations can be surprisingly affordable, but they do take a while to put into place. Exactly how long does it take to renovate or remodel a kitchen? We’re here to give you a breakdown of the average time span for a renovation. Depending on your needs and priorities, completing a kitchen renovation or remodel will take between 4-10 weeks. This estimate includes time for planning, shopping, demolition, and installation. It all begins with a concept, and inspiration is everywhere! Magazines like Better Homes & Gardens, websites like Pinterest are loaded with awesome ideas! Sometimes even walking through the Ikea showroom can spark creative ideas. It doesn’t matter whether your style is all about clean lines, classic bevelings, bold colors, or sleek accents – planning is crucial. Think through what you want and whether or not you need a full remodel. Often, new cabinets are all you need since your appliances are only a few years old. Or it’s possible you want to gut the whole thing and start from the ground up. Once you have your vision in place, you can set down a reasonable budget and start building your timeline. Okay, so you want to create an entirely new or custom kitchen. You will look at the possibility of some new interesting or even custom cabinets, all new flooring, new appliances, and some cool new countertops. Once you’ve settled on a design, go shopping. Pricing out all the different pieces can be time-consuming, and you’ll most likely spend 1 – 2 weeks getting everything together in order to complete your project. Our recommendation is always to go through an expert contractor who can advise you and, in most cases will receive better pricing deals. With Turner Carpentry, installations are streamlined and the company will hold all the responsibility for the project from start to finish. At the point when you’ve picked a trusted contractor as your project partner, they will help acquire all the supplies, and set up your project components, you’ll be approximately four weeks in. Demolition, to us, is the fun part. Even better, it’s the quicker part of a renovation! Making good time is never a problem when you hand someone a sledgehammer and tell them to knock some stuff out. Demolition of the old kitchen will take less than a week, but make sure that you have precautions in place to move your temporary kitchen to a different part of the home. For full scale remodels, we’ve seen people move the entire fridge to, say, the dining room and keep all meals microwavable. With a temporary kitchen, you can turn all of the focus to building the kitchen from the ground up. See our other blog post for full details and tips on surviving a kitchen remodel or renovation. Flooring and cabinets are the most significant time eater, and you can expect 1 – 2 weeks to be taken on making sure they’re correctly installed. From there, countertops are dropped in, appliances are slid into place, and finishing touches are applied. Ideally, between four and ten weeks, you’ll have your dream remodeled, renovated, or even custom kitchen ready to show off! We want to make sure your renovation is as stress free as possible. 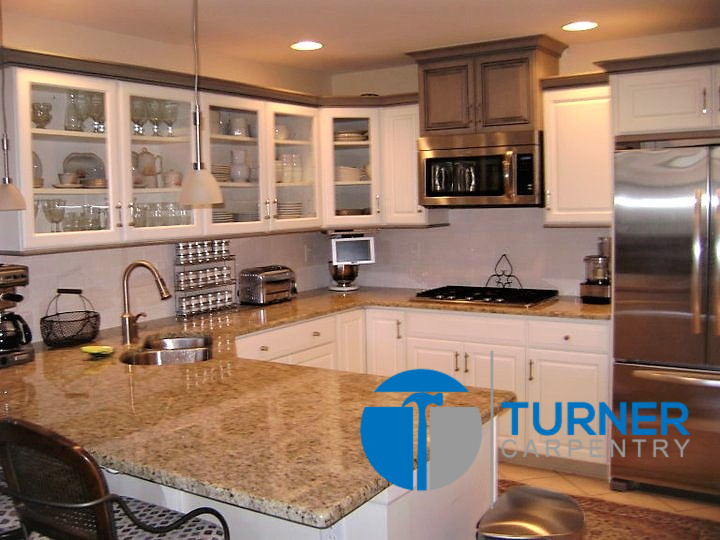 With Turner Carpentry in North East, Maryland, your kitchen renovation or cabinet installation process will be efficient and fast. You can trust us to always make sure we get the job done right. Start your kitchen renovation with us today by calling or using the contact form on our website to schedule your free in home consultation with the owner of the business. Check back for our next blog with more tips on how to survive your kitchen renovation in Cecil County and Bel Air, Maryland!